Our friend and customer Richard Daniels, of Oxnard, Ca, brought his recently restored 1970 Chevrolet Chevelle to one of our California Car Cover holiday photo shoots. 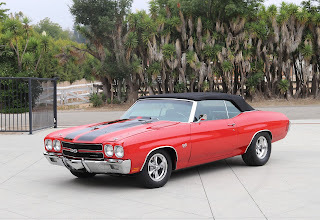 The Chevelle has cranberry red paint with black strips and a black soft top. 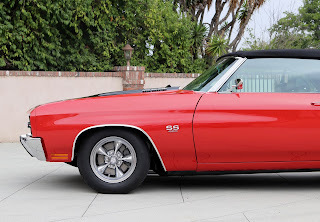 The 1970 Chevelle SS 454 uses Global West Suspension and 4-wheel disc brakes. Interior highlights include power windows and locks, plus a power convertible top. The upholstery was refinished just like the original interior. It still utilizes the factory tachometer and gauges. Under the hood is a 502 550hp engine. Richard wanted to especially thank Frank Saenz for his assistance with this project.